Who would have thought that a couple of experienced old pros who have largely plied their trade in the lower divisions could fit in so successfully to a team striving to play possession football? Between them the 30 year old Craig Morgan and the 28 year old Jason Pearce have amassed a total of over 800 senior appearances in their careers. Last summer Gary Caldwell picked up Morgan for nothing at the end of his contract at Rotherham. Pearce was signed by Malky Mackay from Leeds United in January 2015 for a bargain fee in the region of £300,000. The two have formed a formidable central defensive partnership for Wigan Athletic this season. In fact Latics have not lost a game when the two have started together in the centre of defence. Their differing styles tend to complement each other. Pearce is seemingly fearless, a player of total commitment who will put his own body on the line for the team’s sake. He is strong in the air, rugged in the tackle and rarely wastes the ball. Morgan too is strong in the air and relies on his timing and positioning to cut out opposition attacks. Unlike most central defenders with type of his career background, Morgan resists the hoof and is a fine passer of the ball from defence. Both players have had injury problems this season, the result being that they have only played in the same starting lineup 16 times of the 41 matches played. Sometimes they have played together in a conventional back four, on other occasions being joined by a third central defender. Morgan has made 31 appearances this season, with a red card received against Bury in the League Cup and 6 yellows. Pearce has made 25 appearances with just 3 yellows, a low ratio for a player with a physical approach, revealing a level of self-discipline and maturity. Before the season started Caldwell had a difficult choice between the two as to whom he would name club captain. Morgan had been captain at Peterborough at the age of 23 and skippered Rotherham to promotion from League 1 to the Championship and then holding their place there last season. Pearce had also been captain at the age at 23 at Portsmouth, going on to lead Bournemouth and Leeds. In the end Caldwell chose Morgan as captain with Pearce as vice-captain. 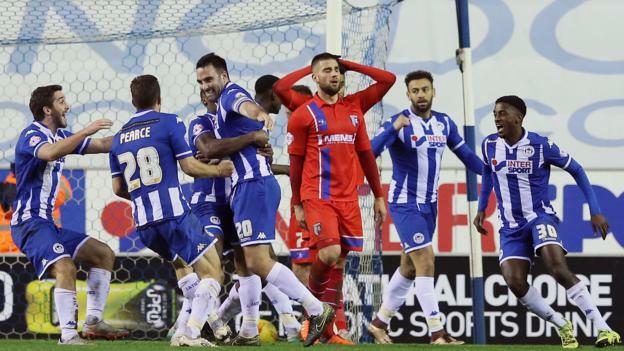 Both players are leaders on the field of play and their partnership in the centre of defence has been critical in Latics’ rise to contention for an automatic promotion place in League 1. Pearce missed the last game at Colchester after being forced off by injury at half time in the previous match at the DW Stadium against Peterborough. With just 10 games to go Caldwell will be hoping that the two can steer clear of injuries and suspensions for what remains of the season. Their joint presence is critical in Wigan’s quest for promotion. ← Can Latics hold their nerve for automatic promotion?